Keep up to date with the latest news from the Waverton Parish Council. Myself, Rob Boulton and Sgt Collinson attended a Careers event for Children who don’t have the usual career options ahead of them due to various disadvantages in their lives at the Cheshire View, this was a really positive interaction with the children and I think some of them were genuinely inspired to look at Policing as a career afterwards. Foot patrols around the Villages are being received well by residents and I’m looking forward to continuing to build a strong relationship with the communities. The only thing worth noting is the amount of Fraud we are seeing with our elderly and vulnerable residents. Not just villages but all across the country. We are trying to tackle this but please be vigilant and pass it on to anyone else that if they are concerned about a suspicious email or telephone call, ring it in to 101. No reports coming through of Anti-Social Behaviour in the Villages, I am continuing to patrol any areas that have had problems in the past and a resident in Waverton mentioned kids hang out in the bowling green of an evening so I will check here when I am on late shifts. I have continued to focus on speeding motorists on our Village roads and will be out with the TruCam this weekend. If you have any roads that you think need attention please pass that on to me so I can head out with TruCam. The Police and Crime Commissioner has said that he wants all PCSO’s to be active on the Police social media accounts. This hasn’t changed since last month so if you don’t already and would like to see what I’m up to day to day then follow Chester Villages Police on Facebook or Twitter. Discover footpaths you didn't know existed! Starting at 2pm at the Burley Hall Car Park. Hi all, please see below the monthly update for February. I have spent some time trying to find people breaking in to an abandoned farm house in Rowton on the A41, the owner is not available and it has been left in a state of disarray for a number of years now, recently having people break in for whatever reason. We have contacted Fire about it to see if it is a hazard so I’ll keep Rowton Parish Council updated on this. I have been out in Christleton a lot meeting different groups of people, I have started to build a relationship with the Community Payback team by attending the Church grounds with them if I am on shift at the same time they are working there. Myself, Rob Boulton and Sgt Collinson are attending a Careers event for Children who don’t have the usual career options ahead of them due to various disadvantages in their lives. We are looking forward to this and hopefully offer some direction for the kids attending. Foot patrols around the Villages are being received well by residents, I rarely find a time when I don’t stop to chat with people when out and about. There was a burglary in Guilden Sutton recently, I have done reassurance visits and visited the neighbours to offer some security advice and drop some leaflets off. No reports coming through of Anti-Social Behaviour in the Villages, although Cotton Hall, a charity not far from Waverton and Guilden Sutton have had a spate of issues lately with the youths on site. I am working hard to come up with solutions to this and thankfully it doesn’t seem to be spilling out in to neighbouring villages. I am continuing to patrol any areas that have had problems in the past but there isn’t anything worth noting with regards to this. I have continued to focus on speeding motorists on our Village roads and I have had a member of the community email to ask if I can target School Lane and Guilden Sutton lane as cars are constantly speeding along here. Again, I am happy to work with any of you in this department, so please do get in touch if you want to be involved, or if you have any roads that you think need attention please pass that on to me so I can head out with TruCam. I have said this before but if I haven’t yet attended a Parish Council Meeting in your Village it is because I am not on duty at the time it is being held and we are not expected to deviate shifts to accommodate this. I am invested in our Villages and I am working my hardest to keep our roads safe along with every other aspect of my role, so please don’t think that I am intentionally not making an effort to be involved with the meetings. If you would like to meet me to discuss anything please do pop in to one of the Surgeries listed above or email me and we can set up a meeting when it suits both parties. Thank you to everyone who contributed to the Remembrance event to commemorate 100 years since the end of WW1. Waverton Road Safety Group - "30mph please drive safely"
One of the recommendations from the Road Safety group was putting "30mph please drive safely" stickers on the large wheelie bins. 4 stickers have been distributed to residents who live on the main roads in the parish. Thank you for your support. The full report on the traffic survey and recommendations can be found on the Waverton Parish Council page of the website. 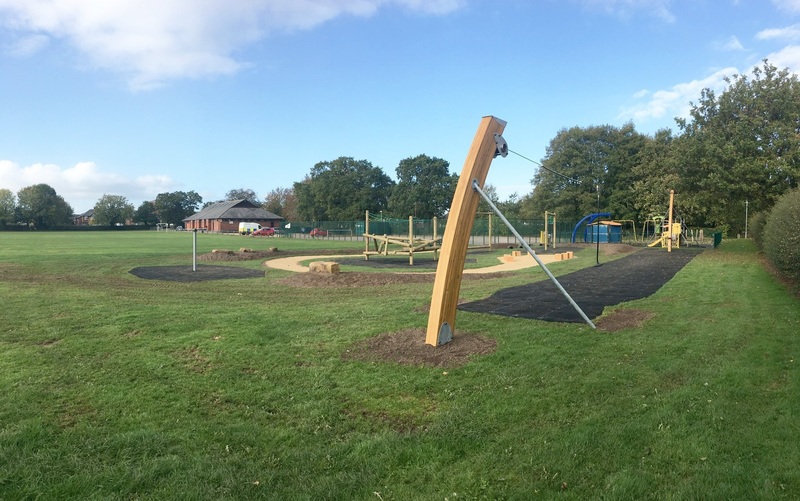 The new play area at the Queen's Field is open. Congratulations to everyone involved. Waverton Road Safety Group have published the background, findings, conclusions and recommendations from the Road Traffic Survey carried out at 5 locations within the parish during June and July 2018. Go to the Waverton Parish Council page on this website to read the report. The draft version was discussed at the Waverton Road Safety Group meeting on 3rd September. As a result, the recommendations were finalised. The final version was considered and accepted at the Parish Council on Monday 10th September. Waverton Men’s Badminton Club are seeking new members! We are a small informal club playing badminton doubles in Waverton Village Hall on Monday nights between 20:15-22:15. All abilities are welcome and you don’t have to live in the village to join us. We are currently taking a break over the summer and are due to start playing again at the beginning of September. If you are interested in giving it a try, then please contact Graham on 07967 331898 or email: graham.tickle@gtscience.co.uk. Defibrillators have been installed on the wall of the One Stop store and on the outer wall of the Village Hall. Both are registered with the North West Ambulance Service who have the cabinet code for access, as have the staff at One Stop and the Village Pharmacy. We will be arranging training sessions shortly - more details to follow. Following successful training sessions at Waverton Villlage Hall, more training sessions available in Tattenhall. We have 2 defibrillators in the village so it’s important people learn how to use them. You never know when you might need to use one, and you may save a life. Learn how to use a defibrillator (free training but a donation is greatly appreciated). Presented by Tattenhall First responders with a maximum class of 12 people. We are delighted to launch our new website that has been built in partnership with Christleton High School. We would like to thank Sixth Form students, Harry Gautier and Charlie Larsen who developed the website. Thanks also to Mrs Farley, Head of Business Education and ICT for supporting the partnership, one we hope to build on in the years to come. Thank you to everyone who completed and return the survey. We are in the process of compiling the results of the survey, and will provide an update in the next copy of The Wavertonian, and on the website.